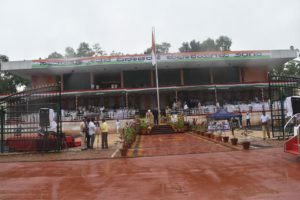 The Management, Director, Principal, Chief admin and the staff congratulates the students for performing with great enthusiasm and zeal, more than 300 JHS students actively performed Patriotic Dance in the District stadium, Belagavi organised by the DC on the occasion of 72nd Independence Day Celebrations. The flag was hoisted by Shri Ramesh Jarkhiholi,District minister accompanied by other dignitaries of the district. The students from Grade V-VIII performed various classical dances on patriotic songs like vishwa vinuthan,shanti kranti, Vande mataram and many more choreographed by Mr Vinay , Ms Anjana Kittur,Ms Akansha Bhat and Jhanvi Hiremath under the team lead Ms. Pallavi Nadkarni.